Van Wheeler was an elite team leader of Guardian's Sierra Team. He'd fought in wars, survived firefights in forsaken hell-holes and moved like a ghost in foreign countries. His team performed missions flawlessly. He'd never regretted an assignment, until he met her. The sweet, brilliant code breaker who'd devastated not only the enemy’s communication cyphers, but also his heart. For Cassie Valentine, life was anything but hearts and chocolates--starvation and physical abuse at the hands of her father and uncle was the norm. Her intellectual genius at solving code brought her to the attention of Guardian and a man who showed her what life could have been like. A cruel glimpse at happiness that she could never obtain. Compelled by a threat to her mother, Cassie returned to the shack in the Bitterroot Mountains. Without a word, she vanished, leaving Van Wheeler, the man who loved her, to forever wonder why she'd left. A year later, battered, broken, and protecting her child, she fled her family's cabin at the top of the Bitterroot Mountains. Cassie knew she and her tiny son would share the fate of her dead mother if she didn't escape. On foot and ill-prepared, she set out into the wilderness of mountainous Montana, unaware that fate, in the form of a Guardian, was about to intervene. Another great story by Miss Michaels. Looking forward to many more. As always, love Kris Michaels’ books so much! Van and Cassie’s book was beautiful and so emotional. Van was a true Alpha male and loved him So much. Cassie has been through so much. I wanted to hug her. 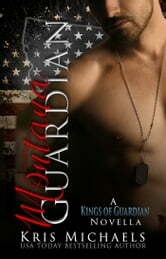 If you love protective Alpha males with a little suspense, you’ll have to read Kris Michaels’ books. Love this book so much. 5 stars!